The publisher of this book is currently out of stock. We have requested copies when it is printed again but we don't know when that will occur. We will post a notice here when the book is again available. This book, translated from a French volume in 1854, was another major source for adult entertainments. Although I have seen books from 1829 for children’s activities, this title is the earliest American book I have seen dedicated to the topic of entertainment for adults. The book is split almost in half between parlor games and mind puzzles. 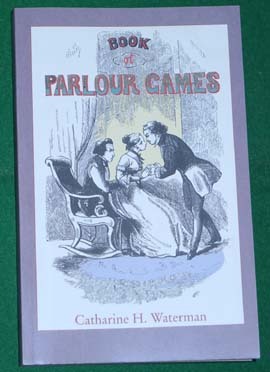 People already familiar with period parlor games may find some that are familiar. However, even though there are some of similar name or the directions seem almost the same, there are some variations that demonstrate the small differences that occur. There are also many games unique to this volume. The second half of the book is devoted to mind puzzles that are found only in this book. They are of a form not familiar to many modern readers. However, to avoid excessive frustration, the answers are supplied.